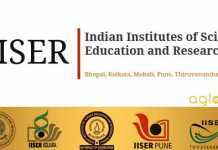 IISER or Indian Institutes of Science Education and Research are a conglomeration of science related education in India, they are a group of seven institutes. IISER 2019 Admission will take into consideration the IIT scores, State and Central Board marks, and also the KVYP. IISER come under the definition of ‘’the institutes of national importance’’ under the directive of the Government of India. IISER Admissions 2019 will also take into account the IISER Aptitude Test. The Joint Admissions Commission will oversee the allocation process related to the IISER Admission 2019. These are the seven places with IISERs in the country-Berhampur, Bhopal, Kolkata, Mohali, Pune, Thiruvananthapuram and Tirupati. 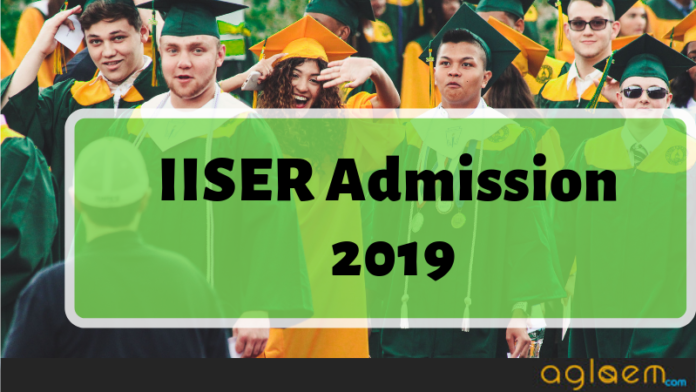 You can check the information regarding IISER Admission 2019 from the below. Latest: Application through SCB has started and important dates are available now. Go to the official website and fill the given specifications. Submit the Application form after filling up the details. Check the channel through which you want apply i.e. The SCB/KVPY/JEE channel. Read the instructions given on the official website. Apply Online: Click here to apply online for admission through SCB channel. SCB(State and Central Boards)-A student must have a 10+2 from a board recognized by IISER. There will be a cut-off percentage for different boards to mark the eligibility. This method also involves taking a IISER Aptitude test. The cut-off list for different Universities will be available here. KVPY(Kishore Vaigyanik Protsahan Yojana)-Students who will begin their 2019-20 Academic session with the KVPY fellowship are also eligible. There will be an additional cut-off criteria attached to this mode. After fulfilling the cut-off percentage criterion, the candidates will have to go through a computer-based IISER Aptitude Test 2019. Here is the last year exam pattern in relation to the IISER Aptitude Test. There will be 15 questions from each section and 45 minutes of time allowed for the same. The IISER 2019 Syllabus for SCB will be driven out of the four subjects-Mathematics, Physics, Chemistry and Biology. IISER 2019 Admit Card will be available online on the admission portal of the IISER official website. Eligible candidates, whose applications were successfully submitted and accepted by IISER can avail their Admit Cards. The candidate would have to use the Email ID, password and captcha to access their Admit Cards. The Admit Card will have basic details like Name, Roll Number, Date of Birth, Exam Center, Photo, Signature. The candidate should make sure they have the admit card while appearing for the exam, no one will be allowed to take the IISER test without the Admit Card. The KVPY fellowship and the cut-off related to it. The results for the candidates who applied through these modes will be published online on the official website of IISER. The candidates who makes it through the list of minimum qualifying marks will be able to get their results. The candidates can check their results by entering the roll number and the registration ID. IISER Seat allocations will be based upon the choice of the channel by a candidate. There will be an allotment list published on the official website of IISER. The students will be required to pay a Seat Allocation Fee or SAF till the given deadline. It is essential for the candidates to check the SAF deadline in order to retain their seats. Insofar, Only application form, dates, eligibility and syllabus of IISER Admission 2019 has announced. Information on this page is based on last year information brochure and for reference purpose only. As soon as IISER will release the information, it will be updated here. For more details regarding the IISER Admission 2019 follow the official website www.iiseradmission.in.